sourceforge and the sonatype snapshots repository for Maven. tested with the native or embedded subprotocols. The necessity to add ALL parameters manually. Even though the OLE DB provider supports parameter generation for commands, the .NET provider doesn’t use it, so you as the programmer must do that work on your own. The lack of support for named parameters. Although they actually exist, using them in reality requires a whole set of complex manipulations (the steps needed to add a parameter to a collection, etc.). The impossibility of using multiple DataReader objects at the same time (Multiple Active Result Sets). ClumpletWriter to ease that ? Are your data access components ready for Firebird 3? We are continuing to actively add new functionality of Firebird 3 DBMS to IBProvider. Let us remind you that already 2 months ago we added support of BOOLEAN data type from Firebird 3. In the new version of IBProvider Professional, we added support of PACKAGE instruction. Now you can put in order a bulk of database procedures and functions and group them by sense into individual modules (PACKAGE). This arrangement will substantially simplify understanding and maintenance of SQL code. Ream more about Firebird 3 access improvements. 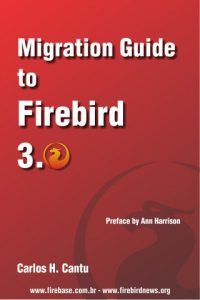 In this presentation Dmitry Yemanov, lead architect of Firebird Project, introduces the key advantages of upcoming major release of Firebird 3. New snapshot of firebird 3.0 is uploaded in debian experimental for testing . And the mechanics of “booleans as values” and “values as booleans” is starting to work in Firebird.